Xiaomi has just followed up its Black Shark (first impressions) gaming phone with an updated Helo model, which brings lots of exciting features into the mix. What remains unchanged though, is the company’s commitment towards providing the ultimate gaming experience at a price that’s way less than similarly-specced offerings from other brands. When it hits the market, gamers will be torn between this device and the ASUS ROG Phone (first impressions), a device that was released a couple of months back at Computex. 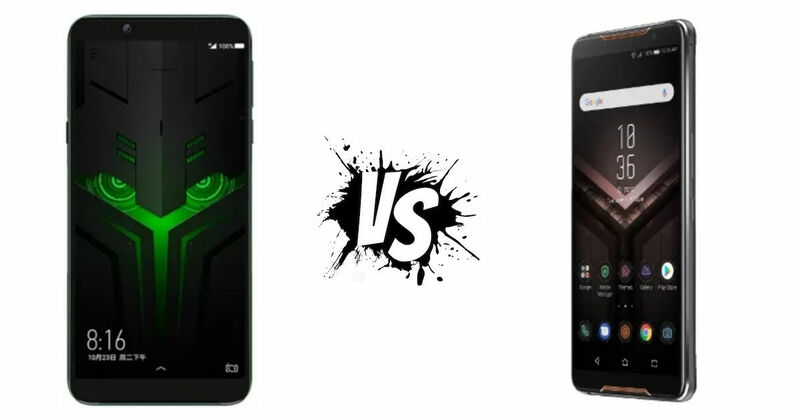 So if you’re wondering which is worth your dough, here’s a detailed comparison between the Black Shark Helo and ASUS ROG Phone. The first design aspect that stands out for both the handsets is their incorporation of RGB-illuminated logos on their back surfaces. Xiaomi’s Black Shark Helo has even placed LED stripes on its sides. Both the phones also offer you the ability to customise the colours on these LEDs. The rear panels on these phones are covered with glass, but while Xiaomi’s handset chooses a conventional fingerprint scanner placement, ASUS has chosen to blend its rectangular fingerprint scanner with the phone’s design language. ASUS’ smartphone even sports two cooling vents on the back that stand out. The Black Shark Helo holds an extra button on its side for activating its gaming mode. A similar mode on the ASUS ROG Phone can just be activated by squeezing its frame. In addition to that, it even has unique AirTriggers on its body. These are basically pressure-sensitive areas that allow you to use them as trigger buttons while holding the phone in landscape mode. On its bottom, the Xiaomi phone has a USB Type-C port and no headphone jack. The ROG Phone features both these things on its bottom surface, while also holding a custom connector on its side surface. This connector houses a Type-C connector that allows you to charge the phone and play at the same time without any hassles. The connector can also be used for attaching the optional AeroActive Cooler accessory that comes with its own Type-C port and headphone socket. Accessories for the Black Shark Helo do not need to be bought which is great. While the 6GB and 8GB RAM models ship with an analog sick, the higher-end variant comes with two controllers for each side of the handset. But that’s about as far as Xiaomi goes with its accessory support. ASUS on the other hand, offers high-quality gaming gear like a dual-screen dock, a mobile-to-desktop dock and even a console-style controller. Both the phones come with front-firing stereo speakers with high-quality audio. The biggest upgrade for Xiaomi’s smartphone over its predecessor is the adoption of an AMOLED panel instead of an LCD one. The 6.01-inch display on the Black Shark Helo bears a resolution of 1,080 x 2,160 pixels. The refresh rate of this HDR10-compliant display stays at 60Hz. The ROG Phone goes for a 6-inch screen with the same resolution as the Xiaomi handset. While the ASUS phone also comes with the HDR-10 screen, it triumphs over the Black Shark Helo with its 90Hz refresh rate. Both these handsets ship with the Snapdragon 845 chipset under the hood. Along with an octa-core processor, the SoC comes with the advanced graphical capabilities of the Adreno 630 GPU. What differentiates the chips on both the devices is that ASUS has overclocked the silicon to 2.96GHz, instead of 2.8GHz. As far as the memory is concerned, the 6GB and 8GB models of the Back Shark Helo ship with 128GB of storage, while its 10GB RAM variant comes with 256GB of space. The ASUS ROG Phone is sold in 128GB or 512GB options, with both of them offering 8GB of RAM. Cooling is a necessity for gaming phones, and the Xiaomi phone tackles this with special vapour chambers designed to dissipate the heat. Another thing that’s worth pointing out about this phone is its dedicated mobile chip by Pixelworks that converts SDR content to HDR in real-time. The ROG Phone houses a GameCool vapour chamber serving the same purpose. Its optional AeroActive Cooler accessory offers an extra cooling boost. Coming to the software, the Black Shark Helo, of course, runs MIUI 10 based on Android 8.0 Oreo. Apart from a gaming mode, it also kicks in a Gamer Studio app aimed at allowing you to tweak things like display settings, CPU performance and networks to create different gaming profiles for each game. As for the ROG Phone from ASUS, its software is based on Android 8.1 Oreo. It includes the company’s ROG Gaming Center app which shows you CPU and GPU frequencies as well as the phone’s temperatures. There’s also the X-Mode which lets you set the CPU clock according to your liking. The camera setup on the back of the Xiaomi Black Shark Helo includes a 12MP + 20MP combo, with the primary sensor offering a f/1.75 lens. The shooter on the front of this device is 20MP in resolution. As for the ASUS ROG Phone, it houses a 12MP + 8MP dual-camera setup, with its main sensor being paired with a f/1.8 lens. Its front camera is an 8MP unit. Both these phones offer 4,000mAh batteries. And while both also deliver fast charging, the ASUS handset charges slightly faster than the Xiaomi one. If money is no bar, then the ASUS ROG Phone is the best option among the two for those looking for gaming phones. The incredible amount of detailing that has gone into designing this device is outstanding. But if you’re strapped for cash and still want a gaming phone, the Black Shark Helo from Xiaomi certainly wouldn’t disappoint. It’s an impeccable device on its own, and its downsides can only be noticed when it is contrasted against something like the ROG Phone. ASUS has launched the ROG Phone in India Today and it can be picked up exclusively from Flipkart for Rs 69,999. Xiaomi is yet to bring Black Shark Helo to the sub-continent.